Mahindra Mojo 300, rings a bell? Well, it was the first made in India bike that was going to compete with the likes of the CBR 250R and Ninja 250R but the bike’s launch has been getting delayed right from the day 1. Mahindra planned on launching it more than an year back but there has been no news of the bike getting launched for a while. Now amidst the serenity surrounding the bike’s launch, a spyshot from a leaked presentation has emerged which clearly justifies the wait. The Mojo 300 when it gets launched will not look similar to the bike that was showcased before but instead will adopt an adventure tourer sort of a design. The naked bike looked somewhat awkward before but with the addition of the half/full fairing, it looks like a common man’s Ducati Multistrada which is not at all a bad thing. The twin projector lamps housed in the fairing look gorgeous from the front and the bike will surely be a head turner. 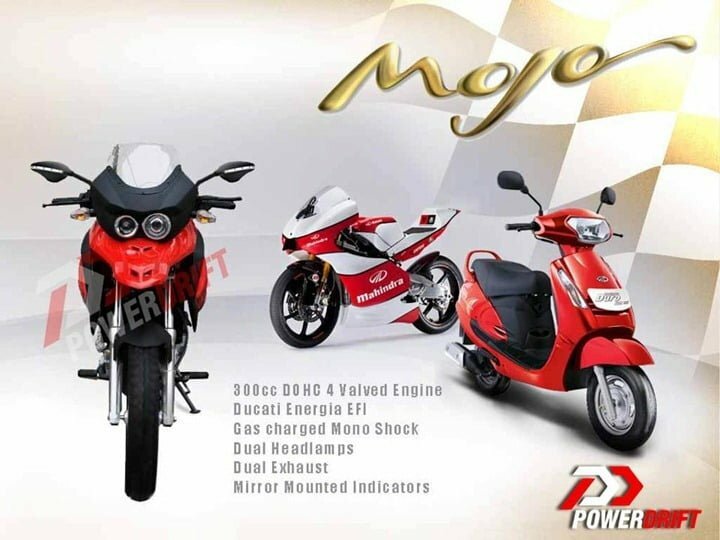 It will be powered by 300cc engine which is expected to develop a power figure close to 30 BHP. The dual projector headlamps would be slightly asymmetrical hinting towards a dual purpose bike. The bike will get the telescopic forks up front and will also get a floating mudguard. What remains to be seen is that will it be an adventure tourer version of the bike with the naked version getting launched alongside as well or will Mojo be rolled out as an on road-off road bike. We brought to you the spyshots of the Mojo getting tested in Pune and the bike is being developed at the company’s Pune facility. The bike has dual exhausts which are not present on any other bike in the 250cc-300cc segment in India and will make for an exhaust note that will be quite pleasing to hear as well. Mahindra does not has a stronghold in the Indian two wheeler market with its mass market products not doing well. But things might be in for a change starting the launch of the bike and the Mojo might just work its Mojo over the Indian customers. It indeed is a poor man’s Ducati Mutistrada.